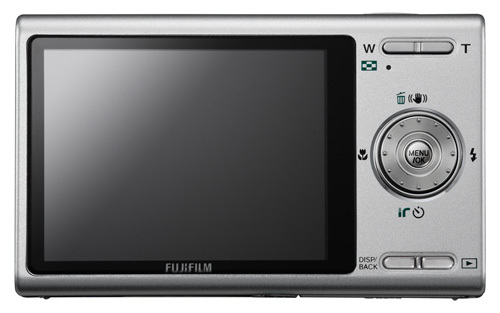 The Fujifilm FinePix A850 (announced 22 May 2008) is an affordable entry level point and shoot digital camera featuring a 3x optical zoom lens (36-108mm equivalent), 8.1 megapixels, and 2.5 inch LCD monitor. The Fujifilm A850 also features selectable sensitivity up to 800 ISO, 14 selectable scene modes, 24 megabytes of internal memory and Picture Stabilisation to reduce image blur dur to camera movement. Fujifilm is pleased to announce the launch of the new Fujifilm A850. The stylish new camera will offer high-end technology to every-day users who want point-and-shot simplicity at an affordable price point, but are not prepared to compromise on image quality. 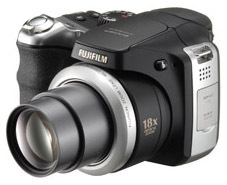 The Fujifilm A850 features a sharp Fujinon 3x optical zoom lens, an 8.1 Megapixel CCD sensor and ISO 800 sensitivity at full resolution. The Fujifilm A850 features Image Intelligence processing combined with a 3x Fujinon lens to deliver images of unrivalled quality. Fujifilm has employed decades of imaging know-how to ensure that each image, no matter how challenging the shooting conditions, is optimised for colour, tone, exposure and colour balance. This makes the A850 the perfect camera for beginners, because the combination of a sharp lens and cutting-edge image processing means that quality images, without overdue effort, will be produced time after time. Despite its modest credentials, Fujifilm employs its Picture Stabilisation (usually found on higher-priced models) to ensure that image blurring, caused by subject movement or camera shake, is kept to an absolute minimum. In addition to this, the Fujifilm A850 offers handy features such as selectable scene modes and movie recording with sound, for versatility and ease of use. An intuitive, icon-based Graphical User Interface (GUI) and simple button layout make it easy for users to navigate through menus and switch between shooting modes and scene positions. The 14 selectable scene modes simplify shooting even further. With options including Beach, Snow, Sports and even Museum mode, users can be creative with their picture taking, regardless of the situation or their experience behind the lens. The Fujifilm A850 features 24MB of internal memory, which is a great fallback storage option, so users can continue to shoot and save pictures even when the media card is full. What’s more, the camera’s low power consumption (operating on two standard AA batteries) means users will never miss out on capturing the action. Lastly, looks are everything for modern electronic products. Consumers demand elegant styling, beautiful curves, and simple ergonomics. They demand a product to be proud of. The A850 does not disappoint in any respect. It has the feel of a high-end camera, with a sculpted grip and metallic finish, and mimics models sold for more than twice the price. Fujifilm has designed three key features into this model: excellent image quality, simple operation and amazingly good looks. The A850 is likely to be the hit camera for this summer’s key selling season. The Fujifilm A850 will be available from retailers from July. Pricing will be announced nearer to the date of the launch. This entry was posted in Digital Cameras, Fujifilm and tagged Fujifilm, Fujifilm Finepix, Fujifilm Finepix A Series on June 3, 2008 by jonathanb. 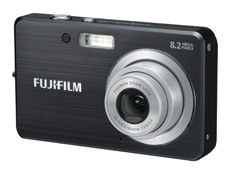 The Fujifilm FinePix Z200fd (announced 22 May, 2008) is a stylish, ultra compact 10 mega pixel point and shoot digital camera. The FinePix Z200fd is ultra slim at just 19.8mm thick and features a 5x optical zoom lens (33-165mm equivalent), dual images stabilization, and a wide 2.7 inch high resolution screen. 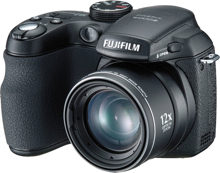 The Fujifilm FinePix Z200fd also features Face Detection Technology, 52 megabytes of internal memory, VGA movie capture of 30 frames per second, two brand new self-timer modes: Couple Timer and Group Timer, intelligent red-eye removal, and ISO 100-1600 sensitivity at full resolution. Fujifilm today announced the launch of the 10 Megapixel FinePix Z200fd, the latest addition to its popular range of ultra-slim, metal-bodied, high performance ccompact digital cameras. Despite being only 19.8mm thick the FinePix Z200fd is packed with state-of-the-art technology including a 5x Fujinon optical zoom lens, Fujifilm’s acclaimed Face Detection technology, intelligent red-eye removal and Dual Image Stabilisation, as well as two brand new self-timer modes: Couple Timer and Group Timer. The FinePix Z200fd features two brand new self-timer modes: Couple Timer and Group Timer. Working in combination with Face Detection technology, the self-timer automatically sets off after the camera has detected faces in a frame. The camera won’t take the photo if one of the faces is out the frame, so there’s no need to worry about someone being missed out of the shot! The Couple Timer mode cleverly detects two faces in a frame and will automatically release the shutter button as the two faces come closer together. The Couple Timer mode has three settings so users can set the timer to detect faces at various distances, whether they are standing side by side, or cheek-to-cheek. Group shots have never been so easy. The FinePix Z200fd’s Group Timer mode can detect up to four faces in a frame and automatically sets the timer to take that precious shot. Using the Face Detection button, the user can select the number of faces in the frame, from one to four, and the camera will only take the shot once all the specified number of faces are in the frame. 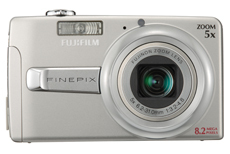 The FinePix Z200fd houses powerful features in an elegant, metal body. This stylish camera comes in four attractive colours – a black and red combination, pink, silver and black – and has a unique diagonally sliding lens cover with a snazzy ‘Z’ logo that illuminates when the camera is switched on. Its slim design means that it can fit easily into a cluttered handbag or jean pocket so your camera is always to the ready. Beneath its trendy exterior, the FinePix Z200fd boasts an impressive Fujinon 5x zoom lens (33-165mm equivalent), Dual Image Stabilisation, which combines CCD-shift and high ISO to combat the problem of camera shake and blurry images, and ISO sensitivity up to 1600. There’s also Fujifilm’s Intelligent Flash system, which sets the power output to achieve natural foreground illumination with balanced background exposure for more natural looking photos. For users who cannot decide whether to use a flash or not, Natural Light plus Flash mode takes two photos in quick succession, one with flash and one without. Both photos are then displayed side by side for quick comparison allowing users to decide which one they prefer. The FinePix Z200fd makes perfect portraits simple with Fujifilm’s Face Detection technology. Face Detection works by triangulating eyes and mouth, using an algorithm to optimise focus, white balance and exposure for up to ten faces in a single frame, and is not confused by spectacles. In addition, the automatic red-eye removal feature can find and instantly correct any red eye from every face in the frame, saving the user the time consuming process of doing it afterwards on the computer. 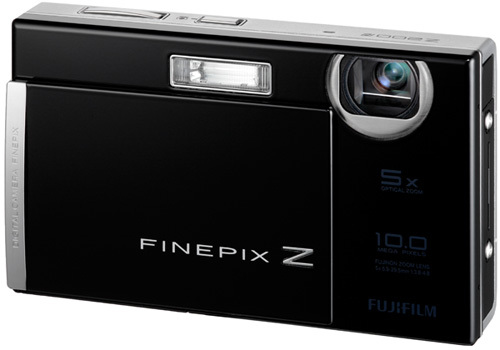 The FinePix Z200fd is a perfect social camera. In addition to the Face Detection technology and people-friendly self-timers modes, the FinePix Z200fd features a Blog mode, which resizes images for easy upload to social networking sites such as Facebook™, and an Auction mode, which combines up to four photos in one frame – ideal for eBay™ users. What’s more, the FinePix Z200fd’s IrSimple™ function allows consumers to share photos from one IrSimple™ device to another. Driving the FinePix Z200fd is Fujifilm’s unique Real Photo Technology (RPT). The guiding principles behind RPT are simple; to set the highest possible standards for overall image quality, to expand digital photography opportunities and to give users fewer wasted shots. With the human eye as the ideal, Real Photo Technology cameras are designed from the ground up to capture ‘real’ photographs with stunning quality – giving users the power to capture the moment exactly as the eye sees it, no matter how challenging the shooting conditions. Adrian Clarke, Fujifilm’s Director of Photo Products, said: "The FinePix Z200fd is the perfect ‘social’ camera for the user looking for a combination of classic styling and cutting edge features. We believe that consumers wanting a super-slim camera shouldn’t have to make compromises on image quality or features, and with the FinePix Z200fd they don’t." New modes including Folder Select (categorise your photos using handy preset folders) and Illustration Mode. This entry was posted in Digital Cameras, Fujifilm and tagged Fujifilm, Fujifilm Finepix, Fujifilm Finepix Z Series on May 30, 2008 by jonathanb. 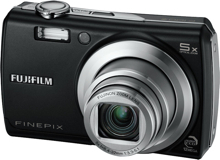 The Finepix S100FS (announced 24 January, 2008) is an 11 megapixel digital camera with a 14.3x optical zoom lens (equivilent of 28 – 400mm). 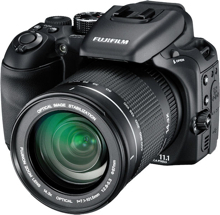 The Finepix S100FS features a 2/3 inch Super CCD HR VIII image sensor, dual image stabilization, 2.5 inch tilting LCD, face detection 2.0, auto red eye removal and ISO capabilities up to ISO 6400. The FS stands for ‘Film Simulation’ (with film simulation modes) and it’s being touted as one of the most advanced cameras to come out of Fujifilm.